Repair Cafe is a Hit! 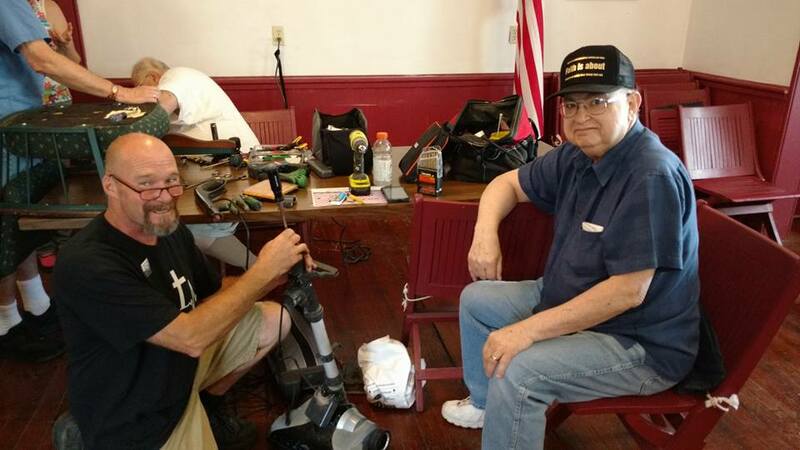 The Inaugural Repair Cafe was held on July 15. There were six repairers, as well as three greeters, 23 "customers," five visitors, and only 4 items that could not be repaired. 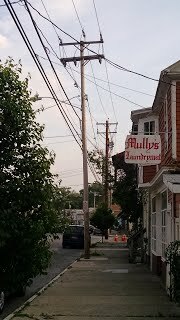 Services included electrical appliance repair, clothing & textile repair, furniture repair, and welding. The most unusual item repaired was a super soaker! The next Repair Cafe will be Saturday, August 12 from 10-2 at the Village Hall. Bring your beloved but broken item, and volunteers will do their best to repair it for free! Mark your calendar! 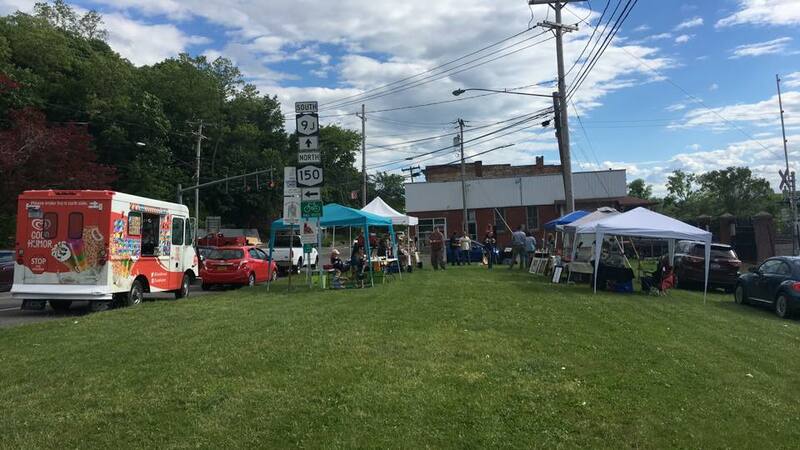 The Castleton-on-Hudson Main Street Association will be hosting Main Street Day on Saturday, September 9 from 11-3. For more details, check out the COHMSA website or follow them on Facebook. 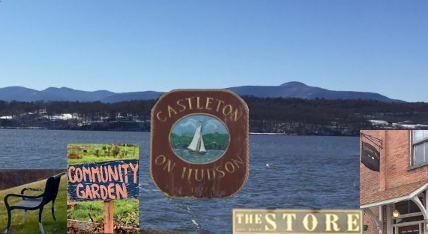 The Village of Castleton-on-Hudson will be hosting Repair Cafe (click to see CNN video of Repair Cafe in Pittsfield) at the Village Hall, 85 South Main Street, on Saturday, July 15, from 10 AM to 2 PM. Bring your beloved but broken item and volunteers will do their best to fix it for free. Trustees of the Castleton Cemetery Assoc. recently unveiled a Historical Marker at Mountain View Cemetery in the Village of Castleton-on-Hudson on Scott Ave. 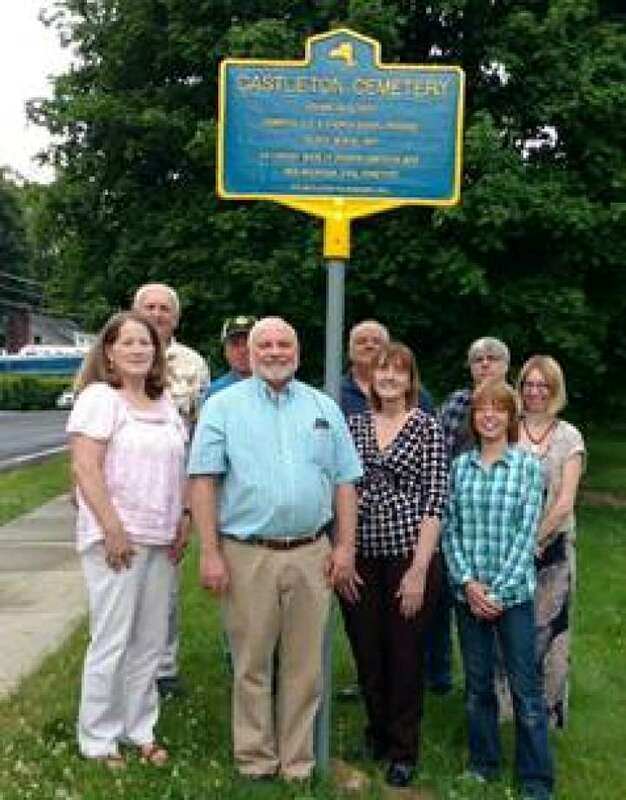 The Association was able to obtain the marker with help from the Village and Town of Schodack. The Castleton Cemetery Assoc. it was incorporated in 1855 by combining the Old & Church Burial Grounds. It is now called Mountain View Cemetery. The oldest burial is from 1811 and includes Veterans back to the Spanish American War. This historical Cemetery is the largest green space in the Village. 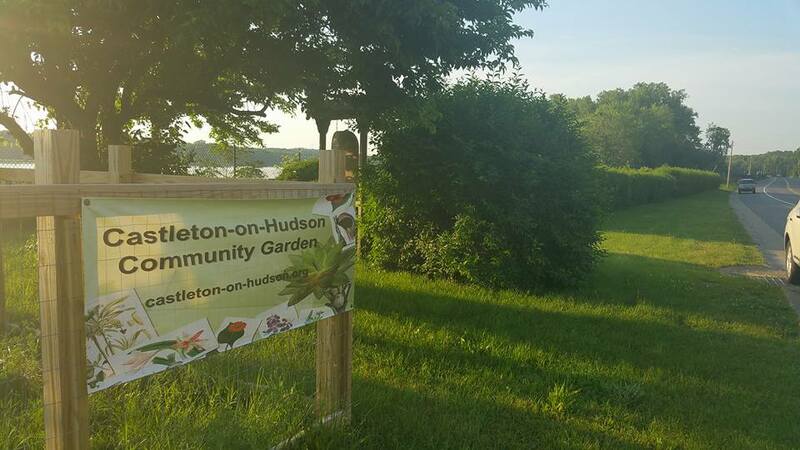 The Castleton-on-Hudson Community Garden (COHCG) has started its second season! All the plots are full. A revised application to the 2017 Downtown Revitalization Initiative (DRI) was submitted. Repair Café Village of Castleton-on-Hudson is a neighborhood initiative that promotes repair as an alternative to tossing things out. The initiators are organizing the Village’s inaugural Repair Café on Saturday, July 15 from 10 AM to 2 PM at the Village Hall, 85 South Main Street. If all goes well, we hope to host Repair Café regularly every two or three months. Residents can bring their broken items to fix them on the spot with the help of voluntary repairers. 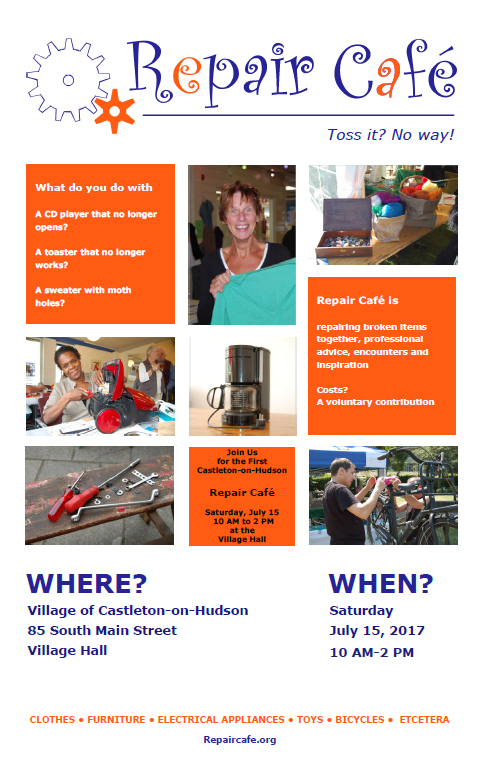 Repair Café Village of Castleton-on-Hudson could use more handy volunteers in the area. Join us! And who enjoy sharing their knowledge with their neighbors. In addition, we are also looking for people who wish to be hosts / hostesses at the meetings, and for volunteers to donate refreshments for the cafe. These volunteers help by providing coffee, tea and baked goods, welcoming visitors and serving as contacts for both visitors and repairers in the Repair Café. Want to know more about Repair Café? 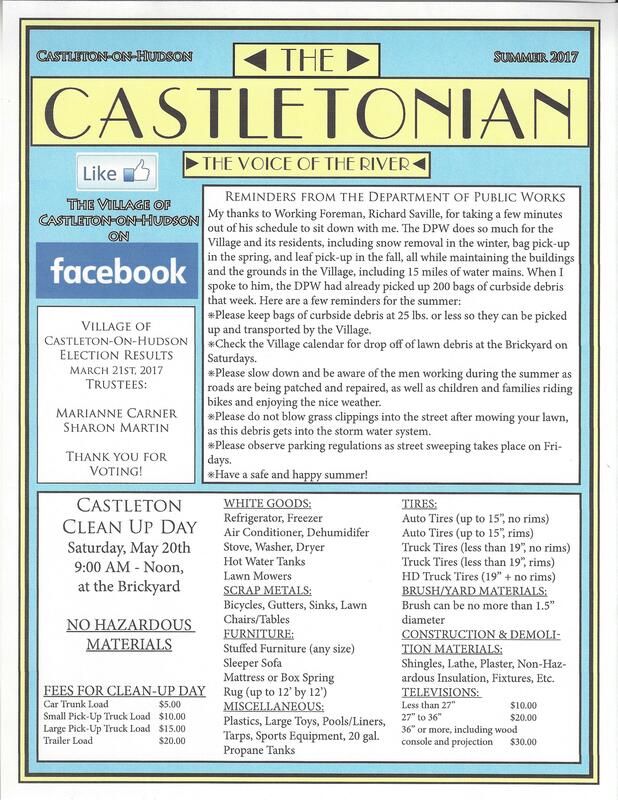 Look at the international website Repaircafe.org, read the Summer 2017 edition of the Castletonian at www.castleton-on-hudson.org and follow us on Facebook at the Village of Castleton-on-Hudson. See you soon at Repair Café! 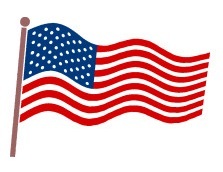 The annual Castleton-on-Hudson/Schodack Memorial Day Parade will be held on May 29, stepping off at 10 a.m. from Boltwood Avenue. The theme of the parade this year is "Honoring Those Who Served Our Country to Insure Our Freedom." Serving as Grand Marshall this year will be veterans from Peter Andrews VFW Post. The Community Appreciation Award will be given to the East Side Quilters. The guest speaker will be Stuart McKnight, a Castleton veteran. Please join us in honoring our veterans. The Village Clerk's Office will be closing at 2:30 PM on Wednesday, May 10, 2017.